Bushmills Irish whiskey has released 2018 editions of its 16-year-old and 21-year old expressions, doubling the availability of the younger whiskey. 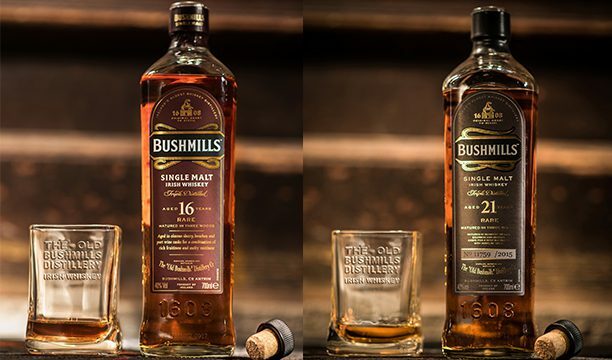 The availability of Bushmills 16 Year Old has been increased by 100% as a direct response to the 25% rise in demand for premium malts last year, according to the Alcohol Beverage Federation of Ireland (ABFI). Bushmills 16 Year Old single malt was aged in a combination of both ex-Bourbon casks and oloroso Sherry butts before being vatted and married for nine months in large Port pipes. Meanwhile, Bushmills 21 Year Old single malt has spent at least 19 years in ex-Bourbon casks and oloroso Sherry butts, with a further two years spent marrying in Madeira wine casks. The Jose Cuervo-owned distillery first launched a small batch duo of 16-year-old and 21-year-old single malts in 2016. Bottled at 40% abv, both expressions will be available from specialist independent retailers and on-trade outlets.